Scalloped Hammerhead Sharks (Sphyrna lewini) are probably the most commonly found species of hammerheads located in coastal regions, appearing in very shallow waters such as estuaries and inlets. Their distribution in the water reaches from the surface down to a depth of approx. 275 m. The young, however, remain mostly in shallow waters along the shore to avoid the danger of falling into the mouths of predators. At certain times of the year and places, and during certain phases of their lives, scalloped hammerheads form very large schools, sometimes counting hundreds of individuals, but they also swim the oceans alone. Some populations remain stationary, others clearly wander, migrating in the direction of the poles in summer. Some sexually-related migrations have also been observed, e.g. females who undertake migrations during particular periods of their sexual development. The scalloped hammerhead shark belongs to the large hammerhead species, and like all representatives of this family, has the typically formed “hammer” consisting of a central dent and an arched front edge (hence the name). Another typical characteristic is the free end tip of the second dorsal fin which almost reaches the tail fin. 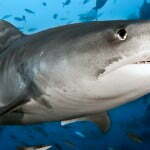 Their coloring is mainly olive, bronze or light brown with a white belly. The edges of the fins are usually darker on young animals but becomes lighter as they grow older. Mature females can reach a length of more than 4 meters, the average length is, however, less. Males reach sexual maturity at a length of about 160 cm, females when they reach approx. 210 cm. The pups measure approx. 50 cm at birth. This hammerhead species feeds mostly on fish such as sardines, herring and mackerels, occasionally also on invertebrates such as octopuses. 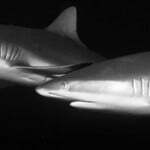 Large scalloped hammerhead sharks also eat small-sized shark species such as the Atlantic sharpnose shark (Rhizoprionodon terraenovae) or the blacktip reef shark (Carcharhinus melanopterus). 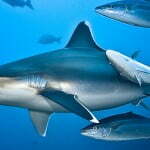 Scalloped hammerheads bear their young alive and have an egg yolk placenta. Pregnancy lasts between 9 and 10 months. Depending on their size, the females give birth to between 15 and 30 pups. The “hammer” is made of cartilage and is very soft when the young are born so as to easen the birth process. Young scalloped hammerheads grow relatively slowly when compared to other shark species. Scalloped hammerhead sharks are found practically around the world in the coastal regions of tropical, subtropical and moderate climate zones. As already mentioned, this shark species tends to form huge schools whose function is presumed to be manifold and may, among other things, concern feeding habits and reproduction. Although many studies also consider this behavior to be a group protective function, this is somewhat questionable since the animals have practically no natural enemies after reaching full maturity. Groups of scalloped hammerheads prefer staying in regions which have pinnacles or sea mounts which reach from great depths practically to the water’s surface. 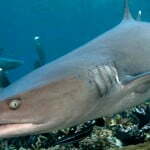 Latest research also shows that these sharks can make use of the earth’s magnetic field during their migrations. Although these sharks have definitely been involved in accidents, they are not really considered dangerous in the sense of being aggressive. Since they often appear in estuaries where visibility is very limited and where the influence of fresh water does not allow an optimal reaction of their electrical sensors (ampullae of Lorenzini), any accidents with humans are more likely a defensive reaction when surprised or frightened. When it comes to size and appearance three additional species resemble the scalloped hammerhead and are commonly found in the latter’s area of distribution. These include the great hammerhead(Sphyrna mokarran), the smooth hammerhead (Sphyrna zygaena) and the whitefin hammerhead(Sphyrna couardi). They can be differentiated by the form of their “hammers”, the first dorsal fins and by color. Identification problems with the whitefin hammerhead are only possible in the latter’s area of distribution which is limited to the Ivory Coast.